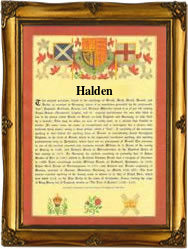 Recorded in a wide variety of spellings, including Halden, Haldon, Haldane, Haldene, and Haldin, this is an English or Scottish medieval surname. It is generally considered to be locational, and if so is either from one of the several places called Halden in Kent, Haldon and Haldon Hill, in Devon, and Haldane's Mill in Dumbartonshire, Scotland, or possibly from now 'lost' villages of which the only reminder in the 20th century is the surviving surname in its different forms. A second origin for some nameholders is as a derived nickname. In this case it is from the phrase or expression 'healf-dene' or 'Half Dane', and was originally a semi- cynical reference to a person one of whose parents was a Dane! This may also, in shortened form, be the meaning of the various places names. What is certain is that the name, firstly as a baptismal name, and then later as a surname, achieved a considerable measure of popularity. It was one of the earliest surnames recorded anywhere, the first known reference being to Goduuinus Halden, in the famous Domesday Book for London, in the year 1086, with a later example being Robert Haldein of Essex, in the Pipe Rolls of that country in 1170. The surname was also a very early recording in Scotland, Roger Haldane being the holder of sixty acres of land outside the castle of Scardeburc in 1255, whilst Elmer de Haldane of Gleneagles, Perthshire, rendered homage to the short lived republican government of Scotland in 1296. Important nameholders included Richard Burdon Haldane (1856 - 1928), the first Viscount Haldane, and Elizabeth Sanderson Haldane, the first woman justice of the Peace for Scotland in 1920.